Google alerts can be used for a variety of reasons by anyone, but for digital marketing purposes, there are some that are essential. These Top 10 Google alerts can be great for small to medium-sized businesses who are trying to get the most out of their online presence while tracking their company’s performance in real time. In summation, the Google Alerts tool is small but fascinating which can detect and track changes on the web and sends customized email notifications to the Google user’s account. Google Alerts originated in 2003 where the search engine innovator announced that users would be able to track specific search terms or keywords that appeared on the internet. It allowed users to then get an immediate notification that directed them to the places in which the keywords were found. How does this affect small to medium-sized businesses? Well, it’s simple. A business owner can set up a keyword Google Alert that notifies them whenever their business name appears anywhere on the web. This lets them track whoever was talking about them or writing about them on the internet. The notification emails are sent immediately to the business owner’s Gmail account. Business owners can use Google Alerts to gain a competitive edge and manage their online reputation. Google Alerts offers many opportunities for digital marketing and anything you can use to gain an edge on the web is important to take advantage of. 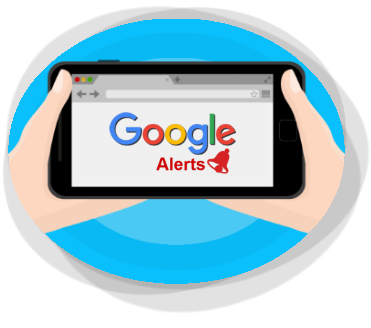 Here are the top ten ways Google Alerts can help in your online marketing campaign. This may seem like an obvious one, but it’s most critical. Setup Google Alerts to notify you of whenever your business is mentioned online. Managing your online reputation is an important factor in your marketing campaign. Find out if and when any negative feedback occurs so that you can professionally address it as well as showing appreciation for any positive feedback. Tracking the name of your business with Google Alerts allows you to stay ahead of negative commenters or reviews that can have a devastating impact on your business. You can also find out where people are talking about your business and interact with them directly to make them happy and solve any problems they may have. A business name and website name are not always one in the same. The tracking system relies on exact keyword matches. It is just as wise to set up an alert for your domain name, in addition, the actual business name. Leave off the Http or www portion of the URL. Track and find out if someone mentions your site anywhere on the web. For example, your business name is Bob’s Tires but your domain is bobstires.com. Setup a Google Alert for each one of these. Part of a well-developed marketing strategy is a strong content marketing strategy. Do you have a blog, podcast or other means of driving traffic to your website? Setup a Google Alert and become notified when your blog post or content titles are mentioned anywhere on the internet. Interact with the users who have embraced your online content as it will help form a lasting relationship with your consumer. Engagement with your clientele can do wonders for business relationships, even ones that originate and form online. Stay on top of all the latest trends in your industry. Be the first to know about breaking news in the line of work your business performs. Allow Google Alerts to do the work for you. It stays on top of the issues that can impact your business most. In the hustle and daily flow of running a business, missing out on important industry trends can be your downfall. Be ahead of the game so you can continue to be an innovator, not a follower. Nothing is more important than keeping up with who and what is happening around your business. The only thing, maybe more important, is what your competitors are doing. The tough world of e-commerce is a cat and mouse game. However, you never want to be the mouse. You want to be ahead of things and the only way you can do this is to know what your competitors are doing. Use Google Alerts to keep tabs on their online activities. Stay in the know about new product releases, promotions and anything relevant that would require you to change-up your game plan. Knowing your audience is key and with Google Alerts you can keep up with news and happenings that interest your customers or clients. This allows you to cater to their needs and wants in ways. Google Alerts enable you to keep pace with consumer trends, recent spending habits and what products are currently in greater demand than others. The more you know about your customers, their habits, and desires, the more likely you are to offer a good or service that is of use to them. Keep an open mind and understand that a customer’s needs often change over time. As a result, your business should be ready to evolve at any time to meet these demands. Business owners, particularly those that own brick and mortar shops are often known by their names. After a long period in business, owners develop relationships and their personal name can be just as synonymous with the business name itself. Setup a Google Alert with your name and be in the know whenever someone talks about you online. This can also be useful for freelancers, authors and independent contractors. If you own a company that can benefit from breaking news then Google Alerts can be a great lead generator for you. Be first to know about things going on in the news that can potentially drive traffic to your website. Create alerts that would mimic headlines in the news. For example. You own a hotel in San Francisco. Set up a Google Alert with a phrase such as “New Hotel Opens in San Francisco.” This can help turn news about someone or something else into leads for your business. Setting up Google Alerts for one of your more popular inventory items can provide a lot of useful insight. Keeping in the know about the items you sell at or services you provide. A Google Alert, for example, can tell you if a product you have plenty of in stock, is suddenly in demand. You can then adjust prices accordingly or create a promotional campaign. Create Google alerts for businesses or items that often share the same consumer base as your company. If you own a carpeting company, create Google Alerts for hardwood flooring sites and all their industry happenings. You might find out why more people are choosing hardwood flooring over carpets. It’s not always about direct competition but the indirect threats to your business as well.